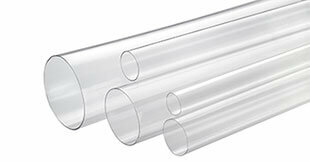 Clear plastic tube packaging is ideal for a wide variety of items including apparel, candy, toys, cutting tools, posters, welding rods, cosmetics, bath salts, beads and virtually anything else you can imagine. All open end packaging tubes are constructed with a clear plastic material that retains its cylindrical shape while remaining somewhat flexible. The material will not split or crack under typical use. The plastic tubing provides a barrier to moisture and can be made from FDA approved resins. These features, along with our industry leading cap and plug options, offer a unique and economical package. Round tubing in all wall thickness options can be extruded to your desired length with low minimums, but we also stock over 80 sizes, available for immediate shipment.